It’s 72 degrees and sunny in Bellingham today. Then there’s rain in the forecast for a week, so this might be my last chance to post a warm and toasty soup recipe before the seasons change and the weather turns warm and toasty permanently. (Let’s hope!) I’ve been working on this recipe for a while, remaking it with tweaks and adjustments and I’m quite pleased with the final product because it serves up fiber, protein, healthy plant fats and lots of beautiful color. 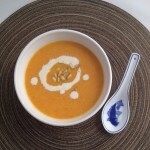 The recent Easter holiday made me think of carrots, and the cool temperatures of the last month made me long for soup. So I was inspired to borrow techniques and flavors from two of my favorite recipes – Creamy Celery Soup (from Jenni at the Plum Palate) and Roasted Cumin Carrots (from Real Simple) and combine them into one beta carotene blowout. 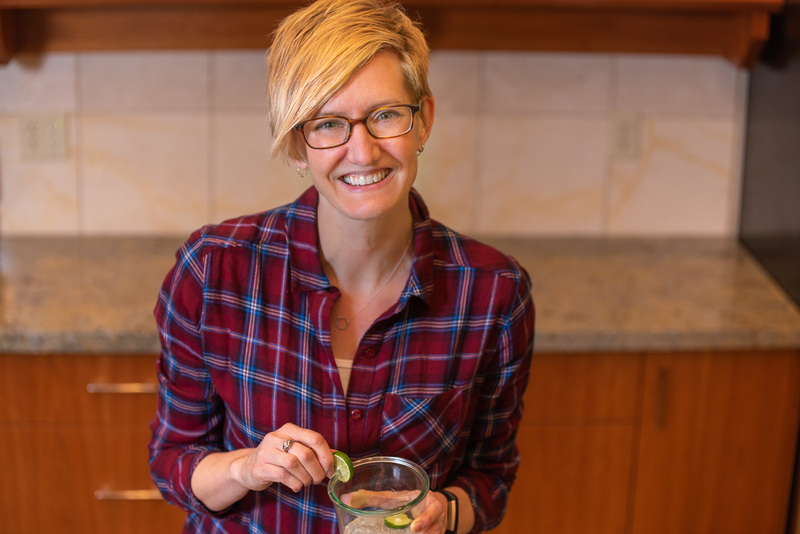 Jenni created a rich, velvety mouthfeel with cashew cream, so I thought I’d try the same technique with pine nuts. And there is something about bringing together oranges and carrots that really works. This soup is mostly savory with a little bit of sweet. 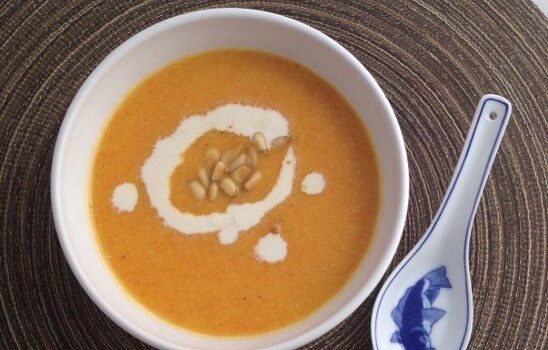 Pine nut cream does a great job of replacing dairy, and roasting the carrots adds a layer of rich flavor. Soak ¼ cup pine nuts in water overnight. Preheat oven to 400 degrees. Toss carrots with 2 tablespoons olive oil, salt and pepper. Spread on large baking sheet and roast for 25 minutes or until very, very soft, stirring halfway through. While the carrots are roasting, begin the base for the soup. Heat remaining 1 tablespoon olive oil in large soup pot over medium heat. Add shallot and cook for 3-4 minutes until soft. Add garlic and cook for just 30 seconds. Add white wine and simmer until wine is mostly evaporated. Add vegetable broth and potato. Bring to a boil, then reduce heat and simmer, covered, for 8-10 minutes or until potato is soft. To make pine nut cream, drain soaked pine nuts. Then blend with the ¼ cup water until very smooth. It's such a small volume that it's kind of tricky in a full-sized blender. I used my immersion blender in a wide-mouth pint mason jar. Toast remaining ¼ cup pine nuts. I used a very small cast iron skillet over low heat. Keep a close eye on them as they can burn easily. Remove soup pot from heat and add roasted carrots to potatoes and broth. Using an immersion blender, puree soup until smooth (or leave it a little chunky if you'd rather). Be careful; the soup will be hot! Stir in cumin, orange juice, and most of the pine nut cream, saving some of the cream for garnish. At this point you can add water if the soup is too thick. 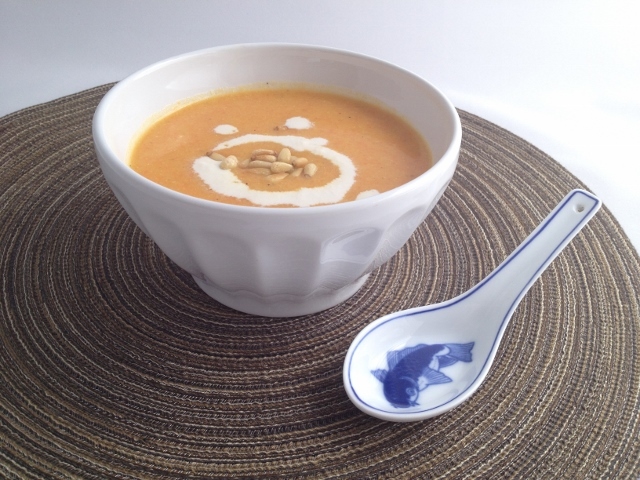 To serve, spoon 2 cups of the soup into your favorite soup bowl. Garnish with a drizzle or dollop of pine nut cream and 1 tablespoon of the toasted pine nuts. If you want to reduce the sodium per serving, you can replace the 4 cups of vegetable broth with 2 cups broth + 2 cups water. Summer will be on its way soon enough which will mean shifting the food focus to ice-cold beverages and crisp, cool salads. But there’s still time to sneak this steamy soup onto your dinner table before the solstice draws near and temperature really starts climbing. Have you ever brought together two of your favorite recipes, just to see what happens? What were the results? This looks yummy…..think I’m going to have to give it a go. You’ll have to let me know what you think. I’d love some feedback.